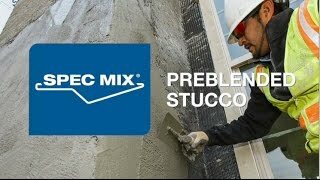 SPEC MIX® Scratch and Brown Preblended Stucco is a dry, preblended cement-based product designed to be used as the scratch and/or brown coat in a three-coat stucco application. This product also can be used as the first coat in a two-coat application for exterior stucco applications. The final wall system will produce a nonload-bearing, aesthetically pleasing exterior veneer or interior finish on concrete or masonry walls, stud walls or metal buildings. SPEC MIX Scratch and Brown Preblended Stucco is produced under strict manufacturing standards, and complete quality control measures are implemented with each batch. A digital printout displaying the proper proportions per batch may be kept as a permanent record. Each SPEC MIX® manufacturer certifies that SPEC MIX® stucco products are designed to meet the project specifications and applicable ASTM standards. SPEC MIX® Scratch and Brown is a dry, preblended cement based stucco basecoat to be used as the scratch and/or brown coat in a three-coat stucco application. SPEC MIX Scratch and Brown stucco has a custom blended sand gradation that increases the walls flexural strength while reducing cracking and crazing. SPEC MIX Scratch & Brown stucco is computer batched for consistency and performance that is unmatched by traditional field mixed stucco. The custom sand gradation also provides excellent workability and finishing properties for the applicator over a traditional field-mixed source. SPEC MIX Scratch and Brown Stucco can be installed over framed wall construction that includes a solid backing: including Fiberboard, Gypsum Sheathing and Wood Based Sheathing. SPEC MIX Scratch and Brown Stucco can also be applied over Concrete and Masonry.